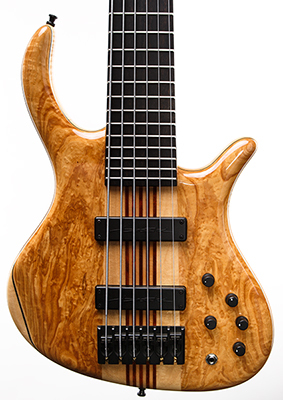 The Schack electronics and pickups are designed to bring out the natural organic sound of the wood without colouring the tone. Nevertheless, they are powerful enough to provide a huge dynamic headroom and offers almost endless possibilities to shape the sound to your choice. 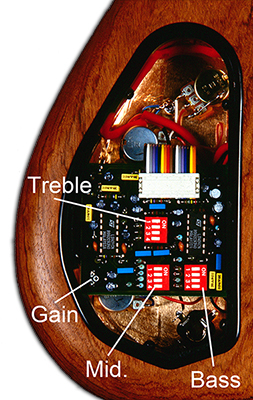 We exclusively use our company-designed pickups and electronics in all our bass guitars as a constant element in the chain of sound influencing factors avoiding the use of various other model pickups and electronics that would cause the sonic outcome less predictable. Our Schack BC-3-P electronic is a high-quality semi-parametric sound control with switchable cut-off frequencies for installation in electric bass guitars. Due to the high operating voltage of up to 24V, the circuit is very low-noise and has an unmatched high dynamic range. Of course, the circuit can also be operated with one standard 9V battery. The pre-amplification is infinitely variable.